Photographers were assigned to a region, not just a city. To this day Imagineer Design is still listed for the Monterey Bay region rather than just Carmel or Santa Cruz. The experience gained over the years is reflected not only in the quality of the tours, but assisting the businesses how to maximize the results gained from their virtual tours. Why use a Google Trusted Photographer? In the beginning the bar was high. Being a Google Trusted Photographer meant something and reflected the work to achieve it as well as meet the ongoing monthly requirements. Not just anyone could publish to Google Maps. Sloppy work reflects badly on you and your brand. It's not just the technical quality of our Virtual Tours which use high-end Nikon equipment and advanced image processing after the shoot. It's also the attention to detail at the time of the shoot with a careful eye to staging your business to look its best. It's also shooting your business without people in the shots. Why? The eye is drawn to people and distracts from your business. And, its a no-win situation. If those distractions are "minimal" your business looks unpopular. If it is crowded with people it may look popular but it becomes impossible to show off your business in its best light. All you see is the people. There are a lot of ways your business is found online, but Google Maps is a leading source of leads for you. 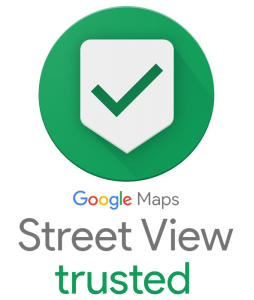 Google Maps is a proven tool that converts online searches to onsite visits. The biggest reason your Google Map listing will convert searches to foot traffic is by having a Virtual Tour and professional photos.